When I was growing up, my family would go to Nguyen Vu often, as it was close to home, but there was a change of ownership along the way and sort of went downhill. 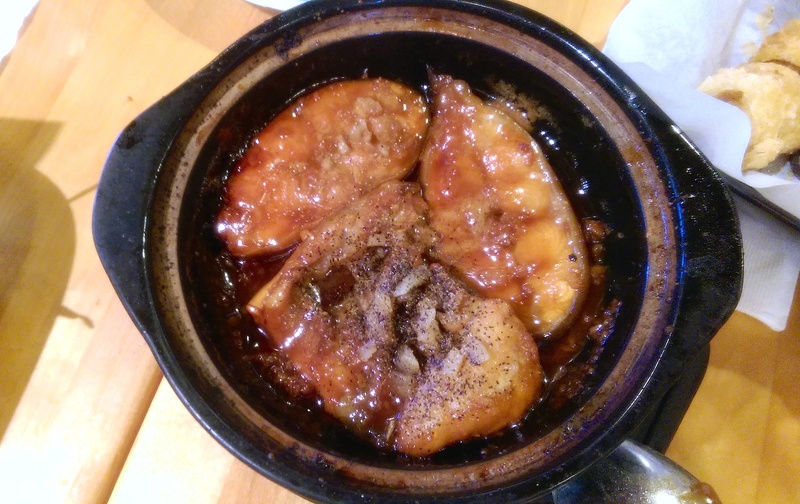 Whenever we ate there, I’d always request the fish claypot dish. This was way before I knew it was called catfish! I just knew that the sauce made the fish taste sooooo goood with rice! As a kid, I generally hated eating fish because of the darn bones. Catfish on the other hand, is easy separate from the bones. Catfish is also bland without sauce, so it must be eaten with sauce. Catfish was, and still is, my favorite fish! Seabass became another favorite as I got older. And tonight, we ordered the catfish claypot dish, called cá kho tộ. Cá kho tộ is traditionally made with catfish and uses a combination of nước màu (caramel sauce), tons of fish sauce, shallots and coconut juice. Although it’s meant to be cooked in a claypot (tộ), you can use any heavy bottom pot that you have on hand. We use Coco Rico (coconut soda) in a lot of our kho dishes in lieu of coconut juice but if you can’t find it at your local ethnic grocery store, the latter should work out fine. Once done, the fish is really tender and I love to spoon the thick, salty/sweet sauce over rice. So good! But just a suggestion, be sure to turn on your kitchen fan while you’re cooking up cá kho because the aroma can be a bit strong. Guess what i am having for dinner tonight?!! Yummy!!! !